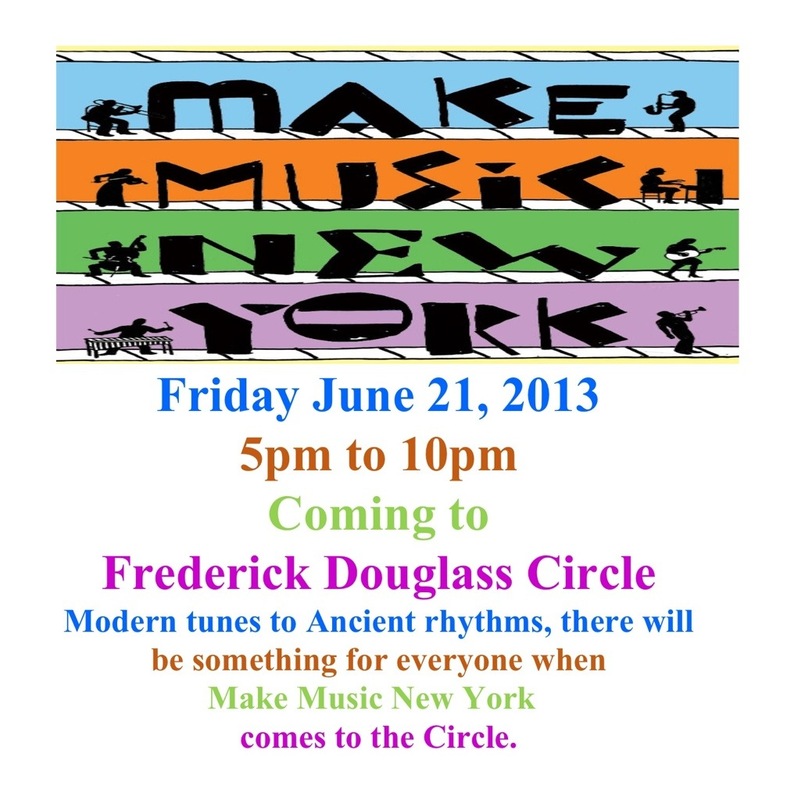 Frederick Douglass Circle | HarlemGal Inc. There are two Harlem holiday lighting events happening for us to attend. Tonight is the annual Holiday Celebration of Lights at Marcus Garvey Park. It starts at 7 pm. Additional details are below. 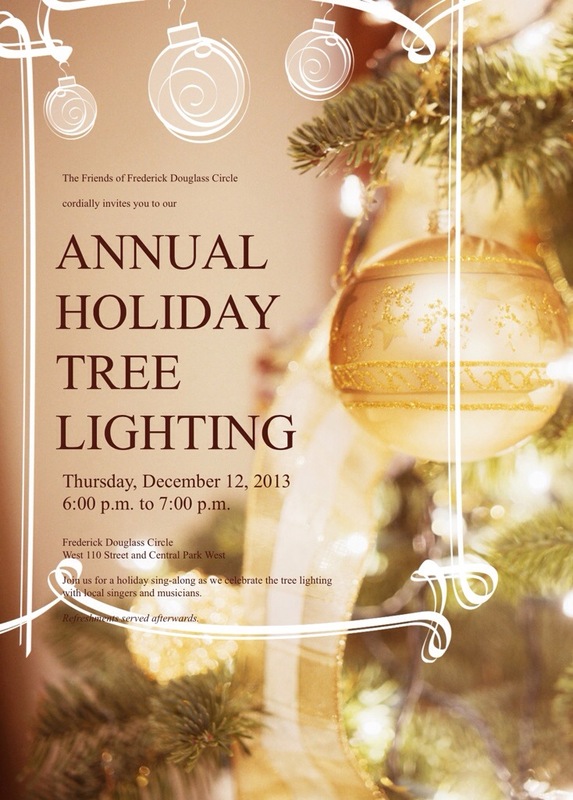 A week from today, December 12th, the Friends of Frederick Douglass Circle are hosting a Holiday Tree Lighting starting at 6 pm. More information below. So in essence our Thursdays are booked for December. Attend one or both events! See you there! 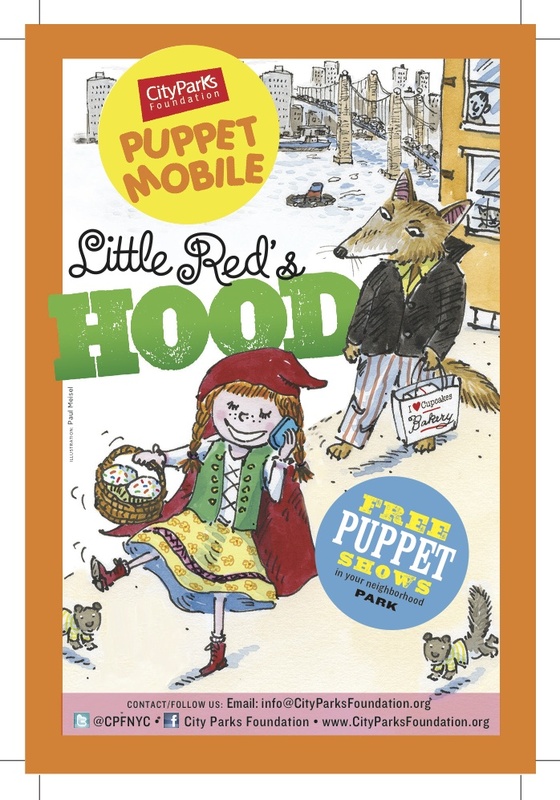 The Friends of Frederick Douglass Circle are hosting a puppet mobile production of Little Red’s Hood in Harlem this coming Sunday, September 15 at 110th Street and FDB. The free event starts at 1 pm and all Harlem friends and family are invited to attend. See you there! Here is the official news release from NYC Parks and Recreation on the Frederick Douglass Circle Dedication tomorrow, Sept. 20 T 11 a.m. The agenda items posted last week about this event here on this site were correct! 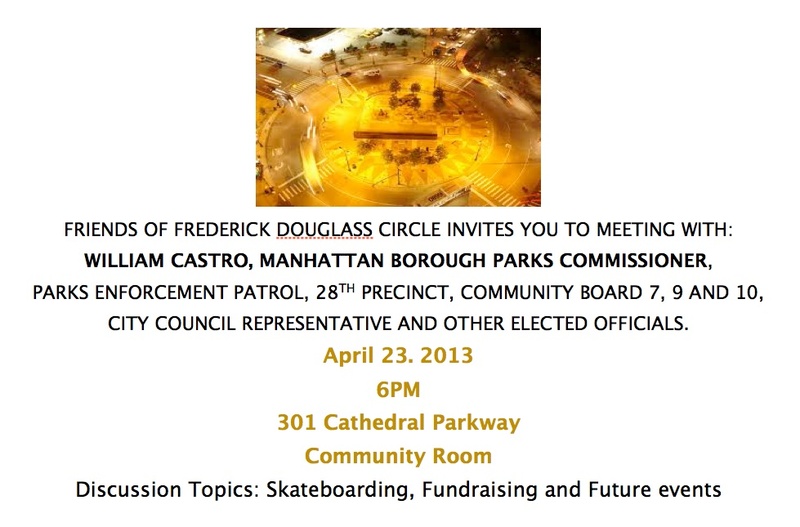 Take note, no Mayor Bloomberg, but Rep. Charlie Rangel will be present! PHOTO-OP: First Deputy Mayor Patti Harris and Parks & Recreation Commissioner Adrian Benepe will join Department of Cultural Affairs Commissioner Kate Levin; Department of Design & Construction Commissioner David Burney; Central Park Conservancy President Doug Blonsky; Congress Member Charles Rangel; Manhattan Borough President Scott Stringer, State Senator Bill Perkins; State Assembly Member Dan O’Donnell; and President of the Frederick Douglass Family Foundation and a direct descendant of Douglass, Kenneth Morris; to dedicate the Frederick Douglass Memorial. Performing at the dedication ceremony will be members of the IMPACT Repertory Theatre, the Harlem School of the Arts, and Tony Award nominee Andre DeShields who will recite excerpts from “Oration In Memory Of Abraham Lincoln,” originally delivered by Frederick Douglass on April 14, 1876 at the unveiling of the Freedmen’s Monument in memory of Abraham Lincoln. DETAILS: This memorial located at the northwest corner of Central Park honors the African-American abolitionist, orator, writer and statesman Frederick Douglass (1818-1895), and consists of an eight-foot bronze portrait sculpture by Gabriel Koren, and a large circle and fountain with ornamental and symbolic features designed by Algernon Miller. In the mid to late 1990s, a series of community-based design workshops organized by the Central Park Conservancy led to the NYC Department of Cultural Affair’s Percent for Art design competition for the circle. In 2003, the competition was won by a collaborative proposal submitted by Harlem-based artist Algernon Miller and Hungarian-born sculptor Gabriel Koren. Miller is also known locally for his Tree of Hope sculpture dedicated in 1972 on Adam Clayton Powell Boulevard. Koren has sculpted the Malcolm X Memorial statue located at the site of the former Audubon Ballroom, where the civil rights leader was slain. For the Frederick Douglass Memorial, Miller’s overall design includes granite seating and paving patterns based on traditional African-American quilt motifs, as well as a bronze perimeter fence with a wagon wheel motif. He also responded to the design competition guidelines with a bronze water wall depicting the Big Dipper constellation that guided those on the “underground railroad.” Koren crafted a standing bronze portrait of a pensive Douglass, cast at Polich-Tallix bronze foundry, and inspired by nineteenth-century photographs. The dedication of the Frederick Douglass Circle, located at the intersection West 110th Street and FDB, is definitely on for next week, September 20, starting at 11 a.m. and HarlemGal Inc. has the scoop on some of the agenda. Actor and Tony Award-nominee Andre De Shields will perform and channel Frederick Douglass in front of all the guests and dignitaries. De Shields is well-known for this and performed as Frederick Douglass in 2009. See video below. Impact Repertory Theatre and Harlem School of the Arts will give performances. And a direct descendent of Frederick Douglass will be present and either acknowledged or part of the speaking agenda. So far, there’s no word on whether Mayor Bloomberg will be on hand for the dedication. However, there will be several local representatives in attendance. Not too bad of an agenda to start! Now that we have a sneak peek of the Frederick Douglass Circle Dedication, the next question is are you attending? Chime in if you plan on attending this event! 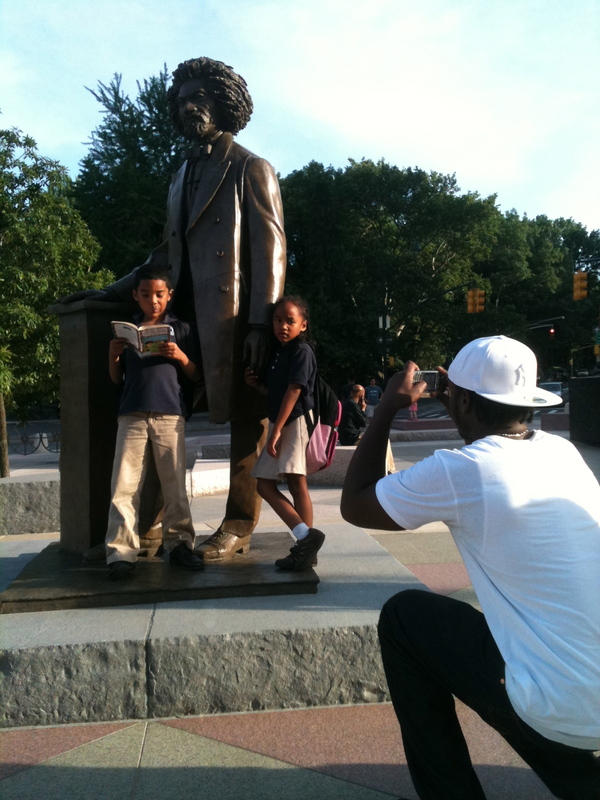 To read complete blog coverage on Frederick Douglass Circle, click here! September 20 is the day. Mark your calendar! That’s when Frederick Douglass Circle, located at the intersection of 110th Street, FDB and Central Park West & North in Harlem, will officially be dedicated by The City of New York. According to the Manhattan Parks Commission, the time is set for 11 AM. Mayor Bloomberg plans on being present as well as congressional representation, and the City is trying to get a celebrity (or two) to join in on the festivities. As soon as more information becomes available, HarlemGal Inc. will pass along. Stay tuned! To read previous coverage on Frederick Douglass Circle, click here. Pardon my lateness regarding this post. I have been on holiday…(still am) and have fallen behind on my blog posting. Any how, I have received several messages about our awesome neighborhood/community, ie the surrounding area of FDB, being chosen as a finalist in Curbed.com’s New York City neighborhood of the year for 2010. That is wonderful news. However, it’s quite not good enough. We need to win it! If you believe our community should win, click here to vote. My understanding is the poll is open until January 1, 2011! I cast my vote! Did you? My favorite boulevard has been featured – once again – bright and big! This time in The New York Daily News. The article talks about all the “chic boutiques, restaurants and cocktail lounges the have cropped up on Frederick Douglass Boulevard above 110th St” in the last few years. It mentions Frederick Douglass Circle, MODSquad, bier international, 67 Orange, Patisserie des Ambassades and more. The article even takes a page right out of HarlemGuy’s word playbook by stating “realtors call this bustling stretch of Eighth Avenue Harlem’s Gold Coast.” As with the other positive articles about Harlem, such as in The New York Times or The Wall Street Journal, I love this clip right up there with others!